Javier appeared on NPR’s Tiny Desk Concert series with 3 other #fttalumni in June of 2018! Watch his performance here. Javier is a part of our “This Land/Our Land” project, celebrating musicians of different cultures. Learn more about the project here! Javier Morales-Martinez performed on Show 331 in Honolulu, HI, on December 2, 2016. Javier also participated in the “This Land/Our Land” project, released in July of 2017. He is performing on Show 370 in Atlanta, Georgia on April 7, 2019. Javier Morales Martinez (clarinet), 18, is a 2018 graduate of the Los Angeles County High School for the Arts and attends the University of Southern California, where he studies with Yehuda Gilad. He is a recipient of From the Top’s Jack Kent Cooke Young Artist Award and performed on the NPR radio program in 2016. He also appeared in From the Top’s video “This Land/Our Land”, celebrating musicians of different cultures. He was a recipient of a Herbert Zipper Scholarship at the Colburn Community School of Performing Arts, where he was a student from 2013-2018 and studied with Michael Yoshimi, Kathy Sawada, and was principal clarinet of the Colburn Youth Orchestra directed by Maxim Eshkenazy. In 2018, Javier made his Sony Classical recording debut in a collaboration with pianist Lara Downes for the album “For Lenny”. In summer 2018, Javier participated in the National Youth Orchestra of the United States in its Asian tour. In 2017, Javier was the first prize winner of the Mondavi Young Artists Competition, won 2nd prizes at the Backun International Clarinet Competition and the International Clarinet Association High School solo competition, and received an honorable mention award from the Music Center Spotlight Awards. Previous to that, he has won prizes in the Michele Zukovsky Competition and has been a YoungArts winner. Javier Morales-Martinez, 15, is originally from Mexico, and currently attends Los Angeles County High School for the Arts (LACHSA) in Los Angeles, California. 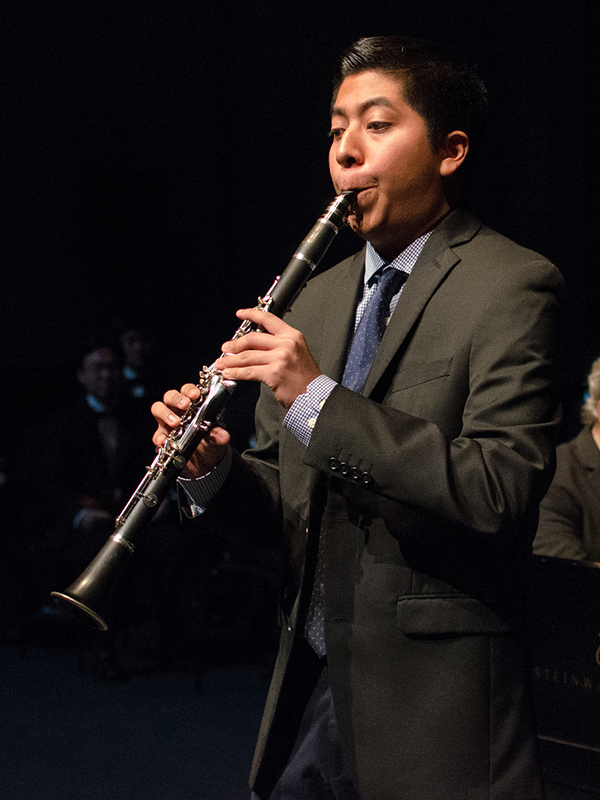 He studies clarinet at the Colburn Community School of Performing Arts with Michael Yoshimi and is a member of the Colburn Wind Ensemble and Colburn Honors Woodwind Quintet. He has also performed with LACHSA Symphony and with Interlochen’s World Youth Symphony. Javier can also play the saxophone, and enjoys his academic pursuits. Javier is a Jack Kent Cooke Young Artist.